What’s About Miami Club Casino? The casino holds a Certificate of Fair Gambling. This certificate proves that the games were audited and approved. 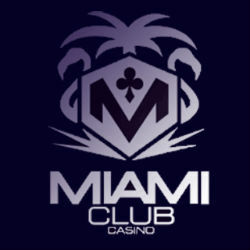 Miami Club Casino withdrawal time is 48 hours, although certain banking methods require more time. Other games: Keno, Reel Poker Slots. The library looks more or less diverse, even though there are not so many titles available. However, live games are not offered, and that’s a serious disadvantage in our opinion. So if you prefer live dealer games, you will have to look for another online casino - this one won’t meet all your needs. The casino offers a pretty decent welcome package which includes 8 bonuses - each of them is a 100% match up to $100. In this way, you can get up to $800. Miami Club Casino free spins are not included in the offer, you can get only match bonuses and earn some reward points while playing the games. There is no Miami Club Casino bonus code required to take part in this promo - you only have to register and deposit $25 or more. The Welcome Bonus itself must be chosen in the Cashier. The wagering requirements are 20 times the total sum of your bonus and deposit. Now let us explain what these wagering requirements are. Imagine that you deposited $40 and got $40 as a bonus. Now you have $80 in total. Now, multiply 80 by 20. You will get 1600. This means that you have to bet at least $1,600 before you will be able to request a withdrawal. Our Miami Club Casino review is coming to an end, so it is time to make a short conclusion. This online casino is a rather interesting place, although its collection of games is not very wide. You may simply get bored here rather quickly. But other than that, Miami Club Casino is not bad.